As part of our labors in the Lord along the Internet Front the online apologetics and discernment work Apprising Ministries closely monitors Intel along the Net not unlike secular Military Intelligence. A major problem in Christendom today would be the weak-kneed milquetoasts among us who would like to make you forget that we are in a war for the souls of men. However, the opening text of Scripture above reminds us of this fierce battle and that we’re to destroy arguments and every lofty opinion raised against the knowledge of God. In other words, we’re not simply here on some picnic where we walk hand-in-hand down a Primrose Lane; we’re supposed to be fighting the good fight of the faith (1 Timothy 6:12). Notice it doesn’t say, take the long vacation and join together with the enemies of the cross of Christ (Philippians 3:18). Hey Silva, those are pretty harsh words you might say. Well the fact is, I didn’t write them; God did. In other words, they belong to the one true and living God of the Bible; and we know that God is love (1 John 4:8). Therefore, these are words of love in concern for those warring against Jesus. Now, you might recall Steven Furtick Bringin’ On Word Faith And The Pastrixes where I began to introduce you to Furtickism, which looks to be a new move. However, it’s not a move of God; but I think after Friday night’s Code Orange De-vival you will see Furtickism slither throughout the younger sectors of mainstream evangelicalism and the whacked Word Faith movement. Prophet-Führer Steven Furtick excitedly introduced heretical Word Faith mogul T.D. Jakes as “The Greatest Preacher Of Our Time. This is the nefarious Word Faith Hillsong Church in Australia where pastor Brian and pastrix Bobbie are the “senior pastors.” Since it’s not the subject here, suffice to say first, we got a little peek at Jakes being afforded a wider evangelical platform. In other words, this Did James MacDonald “Learn A Ton” From T.D. Jakes? tells you that Furtick and Elephant Room II will launch Jakes into the mainstream. Secondly, the despicable WF show Jakes put on Friday night in one of the fastest-growing evangelical churches in the U.S. was very much well-received. This will only embolden more evangelicals to embrace the hybrid attractional/WF stylings of Furtickism. You just watch how much more Jakes-like Furtick will become. Finally, you’ll also see WF mythology—and pastrixes so common within—will find more place within the mainstream of spiritually spineless evanjellyfish. You need to know that pastrix Christine Caine is part of the leadership team of the aforementioned Hillsong Church (HC), which is perhaps best known for its popular worship music. 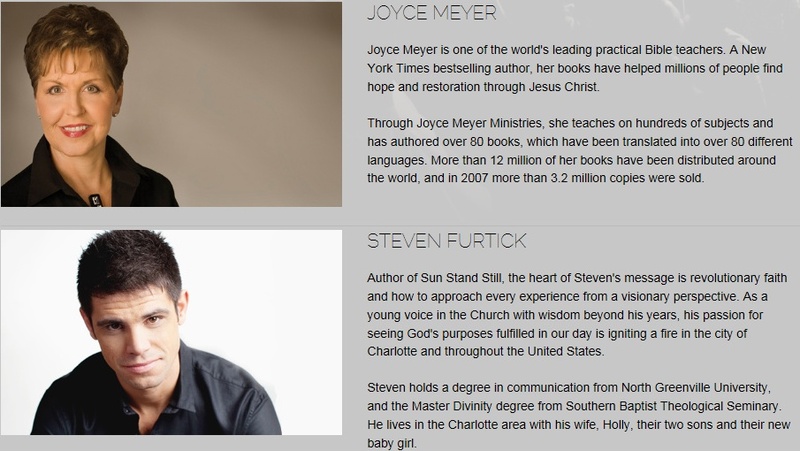 However, HC regularly features the major prosperity preachers of the Word Faith movement at their annual heresy-fests such as Joyce Meyer, Joel and Victoria Osteen, and the master manipulator T.D. Jakes himself. Gifted communicator and Bible teacher Christine Caine reveals the steps to unleashing the potential in each of us. God has divinely created each of us with incredible potential–seeds that can grow into something significant. However, the past, current circumstances, or social conditions can cause us to forsake these seeds or allow them to lay dormant. 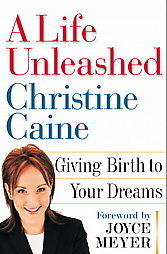 During her 40-week pregnancy, Christine Caine discovered that conceiving, carrying, and giving birth to her daughter has much in common with actualizing our potential and realizing our dreams.In A LIFE UNLEASHED, she uses this metaphor of pregnancy to walk readers through the journey that will ultimately result in experiencing the fulfillment of our own God-given dreams. In closing this, for now, in the video clip below are some lowlights from pastrix Caine’s sermon January 15, 2012 at one of the fastest growing ostensibly mainstream evangelical churches in the United States. Among other things, you’ll hear plenty of praise for Prophet-Führer Steven Furtick, his Elevation Nightclub Church, SBC quasi-Word Faith preacher Ed Young, Jr. and Israel Houghton—worship leader for Joel Osteen. She’ll tell us “nights one, two, three, and four” of the De-vival “were ok” but things are about to get “better-er” because Hillsong-style heretics will be coming up. Pentecostal pastrix Caine shows her belief in classic Word Faith positive confession, where the spoken word is believed to have creative power to “speak into” people’s lives and “into the life of the church.” Therefore we can “declare and decree” our God-given destiny. Caine confesses “God is birthing out a revival” through Elevation Church and its great leader Steven Furtick who “sees what God sees.” Unfortunately though, many of us Christians never in our whole Christian lives ever get to see such wonders because we have “weights” keeping us from “breakthrough.” As pastrix Caine continues her narcigesis she does hold out hope though because Elevation Church brings revival when they show up. track with me on this point—if no other. The Bible says that after forty years, of God doing things a certain way—that He stopped doing it that way. It was supernatural; it was miraculous—for forty years He dropped food out of the sky. And they got used to the way God was doing it. In fact [the Israelites] didn’t even need faith anymore because that was how God always showed up. That’s the kind of miracle God always did… But then the Lord said, “I’m not doing it that way anymore. It was a good way; and it sustained you, but I’m not doing it that way anymore.” The famous last words of the church: We’ve never done it that way before. Most churches end up dying because they don’t understand the manna has ceased…we’re trying to pick up stale manna that is moldy, that has no nutritional value; that is dead, (growing applause) and we keep going back—to our creeds and our bureaucracies and our institutionalized ways of doing things—but the manna has ceased. I’m warning you, you’d best see this for what it is: An attack upon proper doctrine and sound Biblical Christianity in favor of subjective experience. Furtickism is not a move of God; it is satanic syncretism, and an enemy to the faith that was once for all delivered to the saints (Jude 1:3). As this leaven spreads throughout evanjellyfish—and it’s going to—Furtickism will create scores of false converts thinking they’re following Christ only one day to find out that they’re actually on the broad road that leads to destruction (Matthew 7:13). Can you feel Jesus as His heart breaks for these fools who know not what they do; then confront them in love.